Texas hospitality is second to none, so I couldn’t have picked a better place for my first Hoop Shoot and Impact Grant project visit. Communications Specialist Kristen Scaletta and I headed down to the Big D last month by invitation of Jud Good, Southwest Regional Hoop Shoot Director. Kristen will tell you more about the Hoop Shoot contest next week, but let me just say how much I enjoyed the experience. It was amazing to meet the Elks who volunteer their time and talents to produce a spectacular weekend for the contestants and their families. I can’t wait to see how the winners from the Southwest Regional Contest do in Springfield—I have especially high hopes for my banquet tablemates from the 10 - 11 year-old group! Valree makes sure each bag is full of supplies. 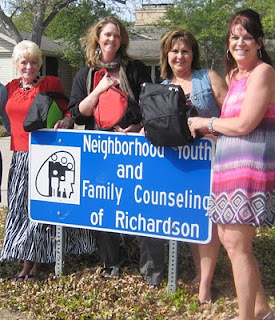 Valree came up with the idea for the Impact Grant project in a meeting with Deb Walsh, Executive Director of Neighborhood Youth and Family Counseling Center of Richardson. Valree knew of NYFC’s good work in the community, so she sat down with Deb to talk about how the Lodge might partner with them for an Impact Grant project. Valree had a “lightbulb moment” listening to Deb talk about how difficult it is for domestic violence victims to flee their homes without toiletries or personal care items. The concept is simple—provide bags filled with emergency supplies, water, toiletries and other necessities to NYFC for victims of domestic violence and other crisis situations. These victims often have to leave their homes at a moment’s notice, without any of their personal or comfort items. 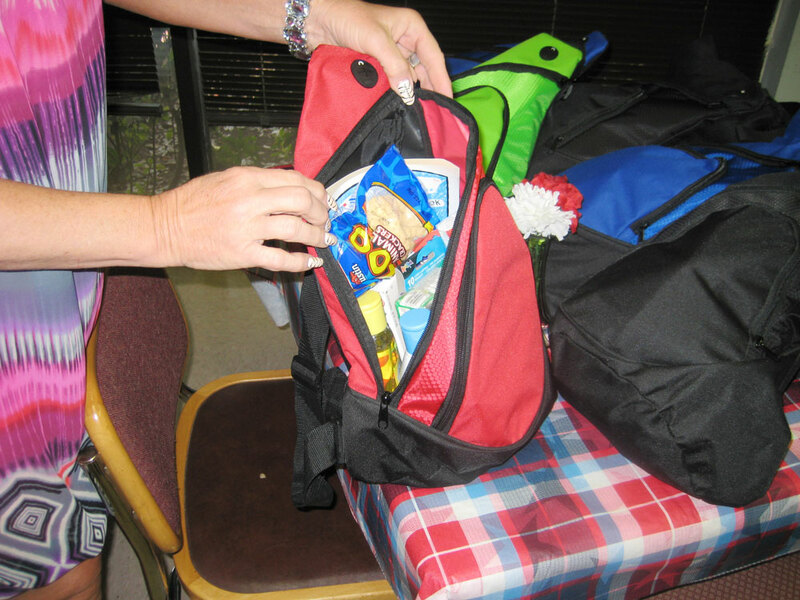 The Lodge also delivers bags for children stuffed with snacks and activities. Valree met us at the Lodge to show us the bags, freshly assembled by herself and a team of seven Elks and Does. The most time-consuming part of the project is the shopping, but Valree found ways to make it cheaper and easier by becoming a regular at the local Dollar Store. Are you wondering why the photo above doesn’t show a duffle bag? I did too! Although the project is called the Emergency Duffle Bag Project, the Elks quickly discovered that duffle bags aren’t as good as sling-type bags, which allow for hands-free carrying and are better for organizing personal papers and files. After touring the Lodge and seeing the bags, we drove to NYFC with Valree and Bill and Rae Arwood. Rae is the president of the Does and assists with the bags project. Bill is a member of the Lodge and was kind enough to chauffer us and help deliver the bags. We were greeted by Deb, who showed us around and told us what the bags and Elks support meant to NYFC. I asked Deb if she was familiar with the Elks before partnering with the Lodge thanks to the Impact Grant, and she said “I didn’t know about them before the project, but I sure talk about them a lot now!” Deb is also considering joining the Order because of the project. The Elks deliver bags to NYFC. In the three months since the project started, six bags have already been distributed. 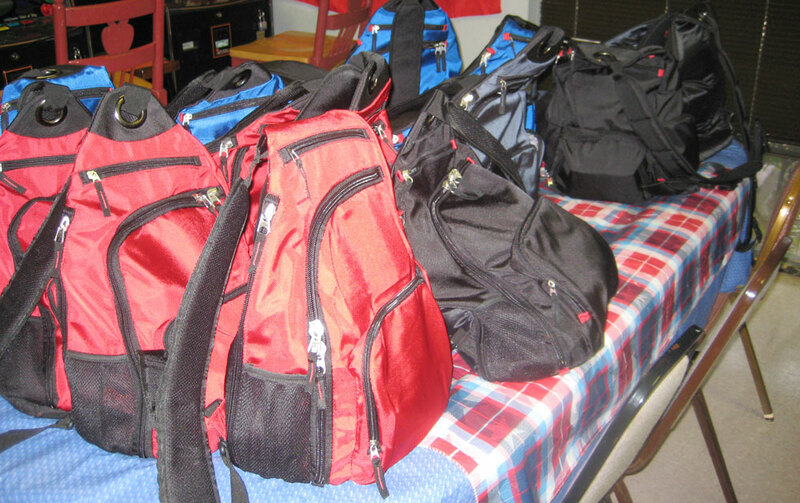 Another 30 are ready to go should the need arise, and more bags will be assembled as needed. The project is off to a great start, and is already making a difference in the community. After leaving a few bags with Deb, we said goodbye to Valree, Deb, Bill and Rae, and headed back into Dallas just in time for the Hoop Shoot Social. Later that night, I thought about the contrasts between the bag recipients and the Hoop Shoot kids I’d met that day. The Hoop Shoot kids, while anxious about the next day’s competition, were laughing and eating sloppy joes, and I couldn’t help but wonder if a family was just arriving at NYFC in need of assistance and an emergency bag. Wouldn’t it be great if no one ever needed an emergency bag? Unfortunately that isn’t likely to happen, but at the least the Plano-Richardson Elks are there to help. A special thank you to Valree Thompson for coordinating our Lodge visit, and to Jud and Deb Good for not only inviting us to the Hoop Shoot, but for making it possible to visit the Lodge and meet with ENF donors and friends during our visit. Texas hospitality at its finest!